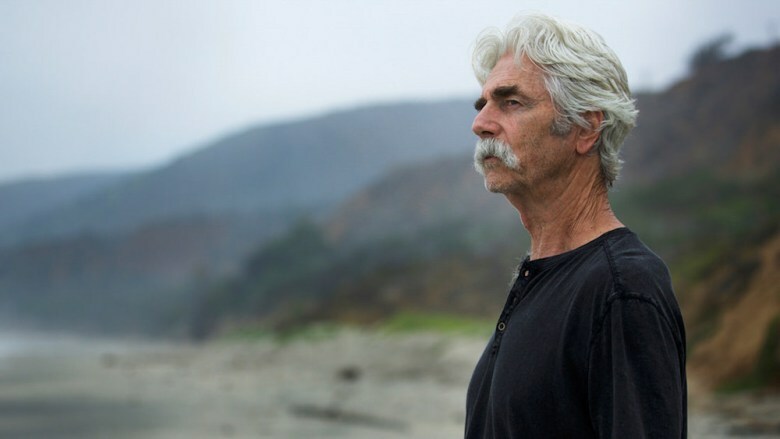 Lee Hayden (Sam Elliott) is a washed up white-hat Western hero dreaming of his next movie while smoking joints and recording voiceover for advertisements. The Hero is a movie about a sad old man, a lightly humorous meditation on living with differing physical and mental ages. Diagnosed with pancreatic cancer, Lee wanders through his twilight existence trying to find meaning in life in the face of mortality. Through his drug dealer Jeremy (Nick Offerman) he meets Charlotte (Laura Prepon), a much younger woman with a thing for older guys. In the spare time between his increasing ailment and the vicarious relationship with Charlotte, he tries to rebuild the burned bridge between himself and his daughter (Krysten Ritter). Even as the film’s script turns to platitudes at its most pivotal moments, Elliott’s Lee is a character whose one-part-genial-two-parts-melancholy attitude toward mortality leads to an intriguing mix of tone in the film. Moments that would be melodramatic in other indie films are played off humorous here, but not so humorous that it is farcical. The line is towed smartly. This film, which could be merely a twilight years crisis narrative, is elevated by Elliott’s quiet performance. Elliott gives one of the best performances in his storied career, and he carries the film with a transfixing, deliberate gait. Brief, fleeting entrances from Prepon, Offerman, and Ritter are also strong, but they pale behind the glow of Elliott. The film understands this glow and plays with it on a literal level. Early scenes in a cramped sound booth and a car cast contrasting shadows over Elliott’s closeup, highlighting his leathery skin, the rippling wrinkles down his neck. Later, Elliott will be washed in warm setting sunlight, angelic. A handful of powerful set pieces elevate The Hero from being the overly meditative one man show that it otherwise would have been. Winning a local lifetime achievement award while high on Molly, reading sides for a hacky sci-fi film audition (twice, to no redundancy) are more transcendent than the moments have any expectation of being. While it still falls into the pitfalls of a film of this ilk, The Hero uses the set pieces and Elliott’s powerful performance to overcome the quagmire of thematic meditation. It is a melancholy film that knows when to inject in a hit of humor, avoiding a finished product that wallows in its contrived melodrama.